Special Offers from Discount School Supply®! : Save Green on Colorations® Crayons! 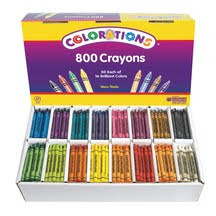 How does 800 crayons for $14.99 sound? Too colorful to be true? Not only is it true, it's also happening right now online at Discount School Supply. This week's TGIF single-item sale at Discount School Supply is an amazing deal! Usually priced at $27.95, our Colorations® Regular Crayons - Set of 800 is on sale for only $14.99. That's right! Only $14.99 for 800 crayons. That's 82% off retail! Color us excited! Teachers and parents, here is your chance to stock up on high-quality crayons for a rock-bottom price. Fulfill all crayon needs for your home, preschool, day care or early childhood center. These crayons are an absolute must for anyone with little learners! Since this deal is so incredible, it will only last for a limited time. Act now to get in on the action. Don't miss out because supplies are going fast! And don't forget to check out all the everyday discounts on school supplies at Discount School Supply. Find great deals on Arts and Crafts, Manipulatives, Curriculum Resources, Furniture and more at DiscountSchoolSupply.com. In the mean time, kick off your weekend with huge savings on another great top-rated product: Colorations® Regular Crayons - Set of 800 on sale for only $14.99. Save tons of green on red, blue, yellow and more when you take advantage of these colorful savings right now at Discount School Supply!